Caiman free games: Virtual Stratton by Slingshot. 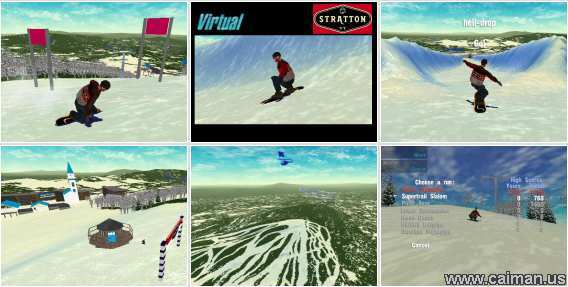 Virtual Stratton is a snowboarding simulation that create`s your perfect powder run ride from start to finish. The terrain is based on geological survey data of the Stratton Mountain resort in Vermont and surrounding area. This game is easy to learn, fun to play and has great replay value. Choose from single run`s through Slaloms, Half Pine, Super Pipe and many others. There is also a free roam helicopter drop where you can get dropped off anywhere on the mountain and make your own trails. Trick`s can also be mastered and will add bonus points to your score once you get a feel for the snow and your board. 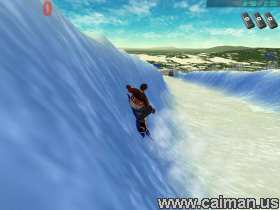 There is also 2 other Virtual snowboarding games, Virtual Breckenridge and Virtual Jay Peak, that once installed you can choose which mountain you want to carve up directly from the menus of all 3 games. All three games are a must download.